Would you move 6,000 miles to be with the love of your life? Hannah did. Unfortunately her plan isn't going terribly well. What was supposed to be a move to Hong Kong to start a wonderful new life with Sam is turning into a move to Hong Kong to spend occasional weekends with Sam, when he can get away from an unanticipated work assignment on the opposite side of the South China Sea. Still, she's optimistic, if woefully unprepared for the intricacies of Hong Kong. Stumbling through the alien city, which she loves, she starts to build a life for herself. Things definitely look up when she finds a great boss to work for, and her best friend Stacy moves to the city too. But alarm bells ring as Sam seems to be getting a bit too cozy with his boss. And when things start going wrong at work, Hannah can't help but wonder if she's made the biggest mistake of her life. 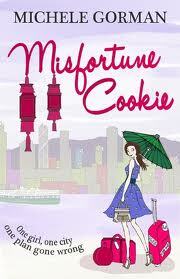 Having just finished Misfortune Cookie I have a great urge to book a trip to Hong Kong as the writer’s descriptive writing pulls you in and makes you feel as if you are walking around seeing the sights with the characters. There was some great humour in this book especially surround language translation my favourite which comes to mind is translation of numbers which results in a very funny and yet very rude comment! As quick as I warmed to the main character Hannah is as quick as I took to loathing her boyfriend Sam, he got my back up from the moment I met him in this book, after his girlfriend has moved 6000 miles to be with him and yet he doesn’t even let her live with him or have the decency to stay in the country! Hannah was a great character although I was a little shocked at how easy it came to her to up sticks and move across the country to be with her boyfriend but then this is what happens in fiction and that’s why I love it so much as it is so extreme and different from my life. One thing I didn’t realise is this book is a carry on from the authors first book Single In The City but I still enjoyed this book I just feel maybe the characters would have felt a little more developed if I had read the first book. I enjoyed the authors writing style and I look forward to reading more by this author in the future. Quite a lovely review. It put me in the mood to pack my bikini and take off on that holiday I'm not supposed to go on. Of course buy the book too.